Dr. Hick returns with the second installment for our year of fearless living. In February we start in the place that matters most: loving yourself. Thanks for tuning back in to my guide to Fearless Living in 2015. For those of you who are new, I will be writing a year-long series on how to live fearlessly in 2015. Fearlessness is by no means a new concept, but remember, friends, concepts are relatively useless unless we also choose to practice. A good concept is a nice idea, but a committed practice for a substantial amount of time (in our case, a year) is what yields actual transformation. Keep these reflections handy as you proceed during the year-long challenge. They will serve as a baseline of where you were and what areas you wanted to transform at the beginning of 2015. Don’t worry if you miss a month or begin late. That ain’t nothing but your Inner Critic stopping you from moving into something bigger and better. Be kind to yourself and your individual process during this time of fearless growth. The way I see it is that the only way truly to love another is to love yourself first. As a psychologist who focuses on helping you build healthier relationships through strengthening your most essential relationship (the one with dear old you) this is exactly where we will begin during the month of love. Yes, you’ve heard it before. But what does “loving yourself” really mean? Loving yourself means that you see yourself as worthy of good things (not necessarily materialistic things!) and take care of yourself in ways that enhance the likelihood of or bring forth more good things in your life. For example, someone who loves herself would take care of her mind and body in ways that enhance her health. No, I am not encouraging you to spend 2+ hours every day at the gym, tirelessly trying to chisel your body to perfection so you’ll finally worthy of using up oxygen. Loving your body and mind is about taking care of yourself, not breaking yourself down each chance you get. Another demonstration of self-love would be someone who sets appropriate boundaries with family members who have been known to put him down. Or who looks for a partner who also takes care of herself and treats him with kindness and respect. Ponder this: What would it be like if you fully, completely, fearlessly loved yourself? 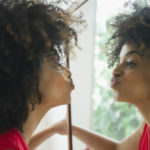 Your reactions to considering the possibility of fearless self-love are likely indicative of the messages you received about loving yourself. In order to transform your love for yourself, it’s vital to understand that fear (the absence of love) is learned and is not your most authentic state of being. To reveal what lies beneath the layers of fear, you’ll need explore and understand the source of your first thoughts, messages, and values around loving yourself. What were the messages you received during early childhood about loving, valuing, and respecting yourself? Were these messages fear-based? Were these messages supportive and encouraging of loving yourself? Did you receive negative, deterring, or critical messages? Or, did you receive a mixture of messages? Were there particular people who influenced or helped shape your love for yourself? What about for your adolescence and your adulthood? It is very common for those I work with to have received messages or to have made interpretations at some point along the way that contributed to their lower self-esteem. Consequently (surprise, surprise) they tend to have some challenges in the areas of work, romance, family, or health. The first step in learning to love yourself more fearlessly is to understand how you came to love yourself in the way you do currently. Explore the following areas of your life and determine how their quality may demonstrate your ability to love yourself, to see yourself as worthy of good things. Or, do any of these areas reflect doubts about your value and worthiness? This is where the fearlessness comes into play. Change—especially changing major areas of life—can be scary, frightening, overwhelming, or for some, exhilarating. Note: perceptions around change can also be an indication of your innate estimation about how much good your deserve. Take action: In the next four weeks, practice every day, as often as you can remember, loving yourself, all of you and everything you may, or may not, become. This may mean giving yourself a break when you misspeak in a meeting, or forget that one thing you meant to do before leaving the house. It might mean standing up for yourself with your boss, setting a boundary with a sibling or friend, not drinking that last glass of wine, or speaking honestly about how you would really rather not go to sushi on a date because you Don’t. Freaking. Like. Sushi. Throughout the year, use these daily, weekly and monthly action plans to help you deepen your work throughout each month’s focus. Daily Action: take 3-5 minutes each day (e.g., before you get out of bed or when getting into bed) or to meditate, journal, or reflect on loving yourself fearlessly that day. Consider how you did the day before, where you identified obstacles, and what your intentions are for the day or next day. Weekly Action: Take 5 -10 minutes at the end of the week (e.g., Friday or Sunday) to reflect on your week of fearlessly loving yourself. Note: Pick a time that generally works for you each day and week, and put it in your calendar or write a note on your bedside or bathroom mirror to remind yourself of your daily action goal. Monthly Action: Take 5 -10 minutes at the end of the month to meditate, journal or reflect on your month of fearlessly loving yourself. Comments: You may find it helpful to share your experiences, obstacles, or successes on this blog, on the MeetMindful Facebook page or my Facebook page. This is the month where you can throw away boring old worn-out notions of self-love and recreate how you would like to love yourself, fearlessly.